ASPHostPortal.com, The Best, Cheap and Recommended ASP.NET Hosting proudly announces WordPress 4.1 Hosting with a combination of affordable price, fast & stable network and uptime guarantees. 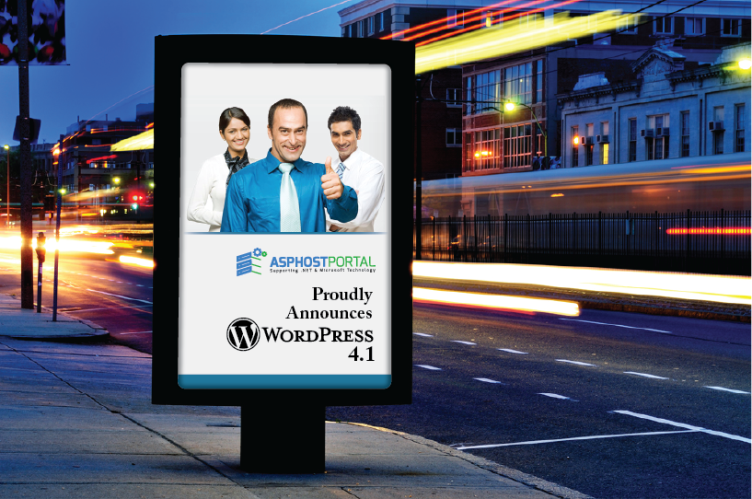 ASPHostPortal.com provides full trust web hosting services for WordPress 4.1 site. After nearly four months of development, WordPress 4.1 is available for download. WordPress 4.1 contains several improvements such as a new default theme, an improved distraction free writing experience, and plugin recommendations. With the release of WordPress 4.1 just a few days ago, millions of people have had the opportunity to use the improved Distraction-free Writing Mode. When you enable Distraction Free Writing mode, the surrounding interface disappears as you type leaving important actions and menu items just a mouse movement away. This mode minimizes distractions without having to go through a clunky transition to access the admin menu or meta boxes. To bring back the menu and meta boxes, move the mouse cursor to the left or right of the editor. On the Add New plugin page in WordPress 4.1, there are two different tabs to help users discover new plugins: Featured and Popular. The recommendations take into account the plugins you have installed and suggests plugins based on which ones are commonly used together. It’s similar to an e-commerce shopping cart that recommends products other customers have purchased based on what’s in the cart. Recovery becomes easy and seamless with their fully managed backup services. They monitor the server to ensure customer’s data is properly backed up and recoverable so when the time comes, customers can easily repair or recover their data. The reason they can provide customers with a great amount of power, flexibility, and simplicity at such a discounted price is due to incredible efficiencies within their business. They have not just been providing hosting for many clients for years, they have also been researching, developing, and innovating every aspect of their operations, systems, procedures, strategy, management, and teams. They are so confident in their hosting services, they will not only provide customers with a 30 days money back guarantee, but also give 99.9% uptime guarantee. ASPHostPortal.com is The Best, Cheap and Recommended ASP.NET Hosting. ASPHostPortal.com has ability to support the latest Microsoft and ASP.NET technology, such as: such as: WebMatrix, WebDeploy, Visual Studio 2015, .NET 5/ASP.NET 4.5.2, ASP.NET MVC 6.0/5.2, Silverlight 6 and Visual Studio Lightswitch. ASPHostPortal include shared hosting, reseller hosting, and sharepoint hosting, with speciality in ASP.NET, SQL Server, and architecting highly scalable solutions. ASPHostPortal.com strives to supply probably the most technologically advanced hosting solutions available to all consumers the world over. Protection, trustworthiness, and performance are on the core of hosting operations to make certain each and every website and/or software hosted is so secured and performs at the best possible level.